I always look forward to Sunday Brunch. It’s probably my favorite meal of the whole week because the food is soulful, filling, and delicious. Since my sister, Zarna, had her birthday party last week, I had a lot of leftover celery. I used it in making a vegetable broth and the subsequent minestrone soup. We used the leaves of the celery to make an interesting spin on pesto. With a nice crispy potato pancake and a perfectly cooked sunny side up egg, this is a great all around meal. For lunch of dinner, give yourself a few of these awesome potato pancakes and make a substantial meal out of it. The key with potato pancakes is to grate the potatoes, put them in a towel, and squeeze all of the water out. Never soak these potatoes in water, because they will never get crisp. If you want to add meat, feel free to fry up some bacon or sausage, which would go perfectly with this. Peel the potatoes and then grate them. Place the grated potato in a kitchen towel and squeeze out all the moisture until the potatoes are completely dry. In a bowl, put the dry potatoes with the onion, egg whites, and rice flour. Mix well and season with salt and pepper. In a nonstick skillet, head a 3 count of olive oil over medium high heat. Add spoonfuls of the potato mixture to make free form cakes, about 4 inches in diameter. Fry until golden brown, turning once. Drain on paper towels and season with salt and pepper. Keep warm. In a blender, combine the celery ribs, celery leaves, parsley, garlic, pumpkin seeds and olive oil and process until smooth. Add the cheese and adjust the seasoning with salt and pepper. In a large nonstick skillet, heat the 2 tablespoons of oil over medium heat. Gently add the eggs and fry, sunny side up, until the yolks are cooked but still runny in the center. My trick is to put them in the pan and cover the pan with a lid, so the top of the egg cooks at the same time as the bottom. Keep warm. Place a spoonful of pesto on each plate. 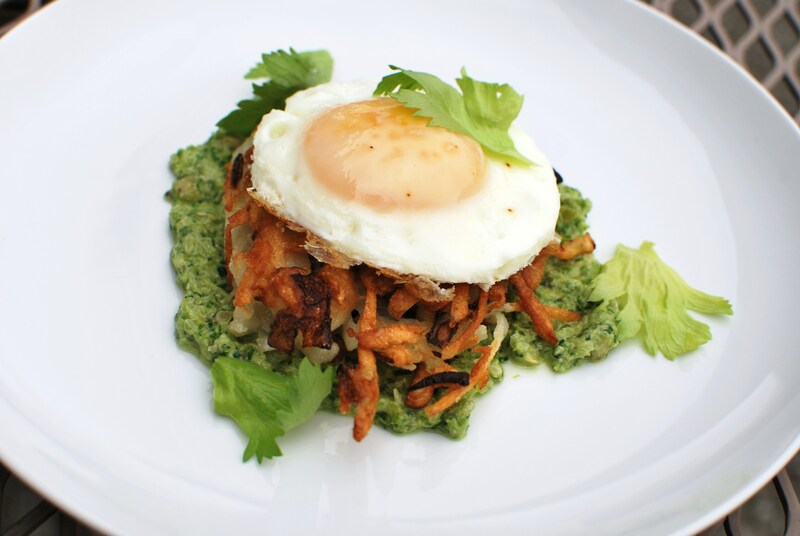 Top with a crispy potato pancake and the sunny side up egg. Season with a little salt and pepper and garnish the plate with more celery leaves. Hope you all enjoy this dish! What do you all have for brunch? ← Homemade Duck Prosciutto – Another Charcutepalooza Project! This was very tasty brunch, I highly recommend. Try Indian tea with it, may be Vivek can write my million years Tea receipe for you. Go ahead and request it? looks great. pesto makes all food wonderful! I do believe a runny egg makes everything better! This sounds so good with the crispy potatoes. Breakfast is a meal I’ll have at dinner a lot of times. this was soooo good! i love the potato cakes…prob bc its a carb. By all means – pretty addictive, aren’t they?